You may have heard about asthma, but did you know that asthma is only one manifestation of a larger disease group called atopy? Atopy is a genetic predisposition of the immune system to overreact after exposure to allergen triggers. An allergen trigger can be anything from pollen to certain foods or a chemical that causes individuals with atopy to develop itchy skin, sneeze or have difficulty breathing. No genetic test is available to screen for atopy. Atopy can exhibit in three different ways: atopic dermatitis (itchy skin with or without rashes), atopic rhinitis (sneezing) and atopic asthma (wheezing). A person can exhibit a combination of symptoms or only one. Symptoms generally develop gradually over time; usually atopic dermatitis starts in early childhood, followed by atopic rhinitis and sometimes atopic asthma in later stages of childhood or adolescence. Atopic dermatitis, also called eczema, makes the skin itchy and flaky. In babies, it can affect the front of the arms, the legs, the cheeks and the scalp. In older children and adults, it generally moves to the neck, the elbows and knees. Symptoms can usually be controlled by applying non-fragrant moisturisers. If these do not suffice, the doctor may prescribe corticosteroid ointments or anti-histamine tablets. Atopic rhinitis affects the eyes and the nose. Individuals may experience sneezing attacks, a runny or blocked nose, poor sense of smell and itchiness in the eyes, nose and top of the mouth. Atopic rhinitis is usually seasonal, triggered by allergens, such as pollen. Many individuals, however, suffer throughout the year, as they are constantly exposed to allergen triggers from within their house or reside in a city like Hà Nội, where triggers such as pollens from plants are combined with extreme humidity and air pollution. The symptoms can be reduced by avoiding exposure to allergen triggers and by rinsing the nose with natural sea saltwater sprays. Your doctor may prescribe nasal glucocorticoids, decongestants and/or anti-histamine tablets. If this doesn’t help and in severe cases, your doctor may prescribe skin tests to identify your allergen triggers to perform a treatment called hypo sensitisation that alters the way your body reacts to an allergen trigger. Atopic asthma is a chronic allergic inflammation of the airways in reaction to allergen triggers. In a healthy individual, the airways to the lungs remain fully open, allowing air to move freely in and out of the lungs. If an individual suffers from atopic asthma the inner lining of the airways swell in reaction to an allergen and excess mucus is produced. This can block your airways, trap air inside your lungs and make it difficult or impossible to breath. Typical symptoms are coughing, wheezing, shortness of breath, rapid breathing and tightness of the chest. These symptoms can come and go and often occur at night. They usually resolve spontaneously or can be treated by inhalers, which have immediate effect. In severe cases, patients will be prescribed oral medicine in addition to regular use of inhalers. As with atopic rhinitis, literally anything can trigger an asthmatic reaction. The most frequent allergen triggers are dust mites, cockroaches, mold, animal hair, pollen, weather conditions and air pollution, strong emotions, tobacco smoke, chemical irritants, infections, exercise and certain medicines. The diagnosis of asthma is generally straight forward, requiring only examination by a doctor with the help of a stethoscope. However, your doctor may prescribe other tests, such as a spirometry or lung function test, to rule out other conditions with similar symptoms. Asthma seriously affects quality of life, as the symptoms can cause difficulty to breath or force an individual to stay indoors to avoid potential allergen triggers. A full-blown asthma attack is a medical emergency with airways swelling and going into spasms that make it hard or impossible to breath. 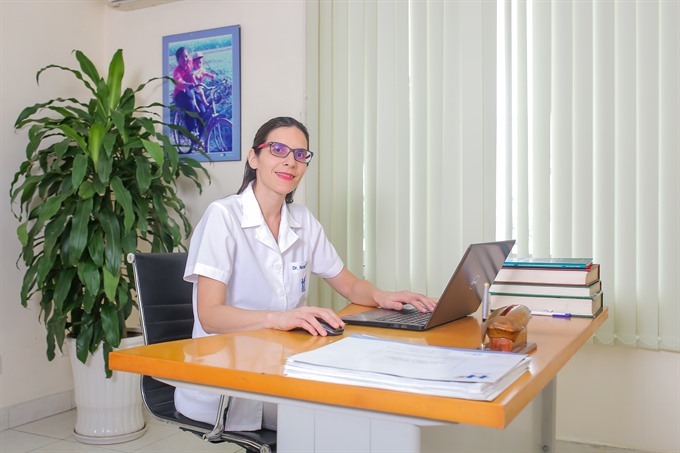 *Dr Delphine Natali is a French-trained specialist in pneumology who recently joined our team. She works with Dr Hai Tran Pham at Hanoi French Hospital. Together they bring state of the art knowledge and treatment for all airway conditions, diseases and allergies.